We offer you five reasons for a spring break in the inspiring atmosphere of the Opatija Riviera. Escape the hustle and bustle of the city for a while, enjoy a relaxing walk on the coastal promenade or in our manicured parks, savour our culinary specialities, visit the Croatian Museum of Tourism, and relax in a wellness centre. A great way to get to know the Opatija Riviera is to take a walk along the famous Lungomare coastal promenade that stretches for 12 kilometres and connects Volosko, Opatija, Ičići, Ika and Lovran. The construction of the promenade began in 1885 after the opening of Opatija's first hotels, which are today known as the Remisens Premium Hotel Kvarner and the Smart Selection Hotel Imperial. The northern part of the promenade was completed four years later in 1889, the same year as Opatija was declared a climatic health resort. The southern part of the promenade, which connects Opatija with Lovran, was completed in 1911 at the time of the greatest expansion of tourism on the Riviera. All you need is a good pair of shoes and your walking adventure can begin. Opatija's special cuisine is full of fantastic flavours, colours and aromas that are difficult to put into words. The cuisine is based on high-quality fish and seafood, fruit and vegetables, olive oil, the region's sweets, and selected wines. The perfect spring blend of Kvarner scampi and wild asparagus will delight even the most demanding palates. A stay in Opatija is unthinkable without paying a visit to the romantic parks of Angiolina and Sveti Jakov (St. James). These central town parks were built in 1884 and abound in lush vegetation that includes both local and exotic plants that were brought here from Japan, China, South America and Australia. The Japanese camellia has become a recognisable symbol of Opatija. The merchant Iginio Scarpa first brought this flower to Opatija in 1894 in honour of his wife. Today, many public and private gardens are decorated with camellias. There is even an annual competition to choose the most beautiful ones in Opatija. 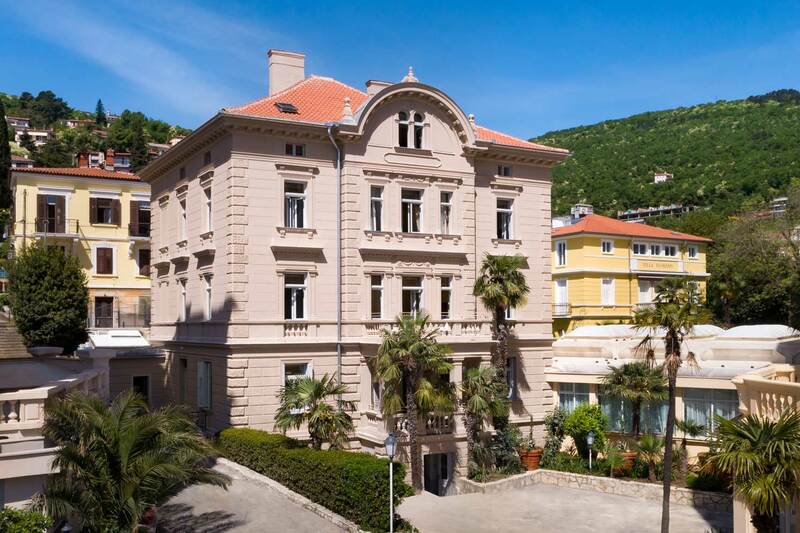 The Croatian Museum of Tourism, located in the 170-year-old Villa Angiolina in the centre of the park of the same name, tells the story of tourism in Opatija and Croatia in general. Visit the collection of picture postcards, tourist photographs, hotel items and inventory, historical manuscripts, maps, souvenirs, and many other pieces of memorabilia. The long history of tourism in Opatija is based primarily on a tradition of health tourism for elite guests. Today, this tradition is continued in numerous wellness centres that are ideal for a spring getaway. A famous one is Opatija's Five Elements Wellness & Spa, which you can find in the Remisens Premium Hotel Ambasador, Remisens Hotel Excelsior and Remisens Hotel Marina. The ancient Chinese five elements philosophy combined with modern wellness & spa rituals gives you the opportunity to dive into a world of luxury for a deep revitalisation of body and mind.